nowing which Elliott Wave a stock is trending in will help you forecast probable turning points... well, in advance. The Elliott Wave consists of five trending waves up and three counter-trend waves down, for a complete eight-wave bull market pattern. The opposite will be true for a bear market... five down, three up. 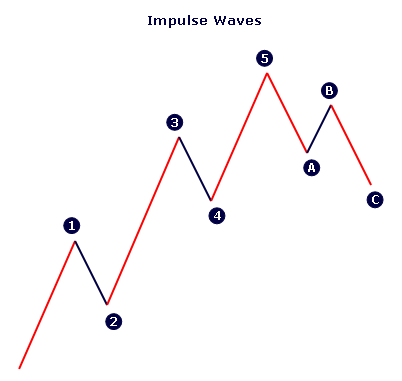 There are two types of wave patterns -- impulse waves and corrective waves. The following illustration shows impulse Waves 1, 3 and 5. Waves A and C are impulse waves, as well. 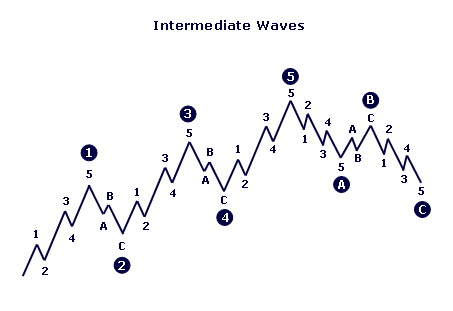 Waves 2, 4 and B are corrective waves. 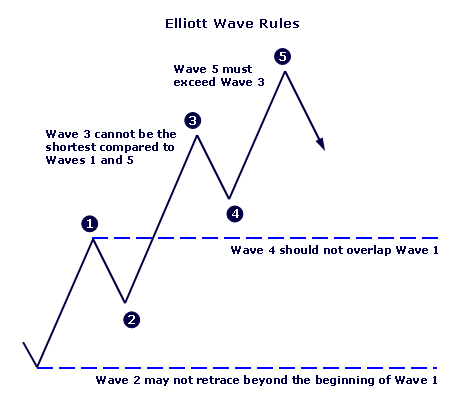 Elliott Waves are fractal by nature... meaning each wave will subdivide into its own complete eight-wave pattern. Additionally, wave patterns repeat in all time frames... from tick charts all the way to yearly charts. Wave 2 may not be longer than Wave 1 or retrace beyond the beginning of Wave 1. Wave 3 may not be the shortest compared to Waves 1 and 5. Wave 4 should not overlap Wave 1. Wave 3 usually is the strongest wave... if not, Wave 5 will be. Wave 5 must exceed Wave 3. The pattern is made of 3 waves. Waves A and C are impulses. Wave B is corrective. 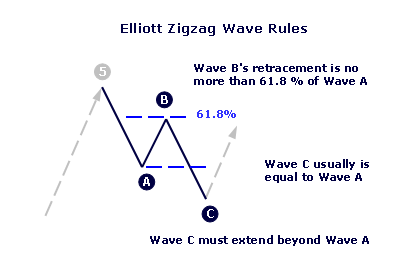 Wave B's retracement is no more than 61.8 percent of Wave A. Wave C must extend beyond Wave A. Wave C usually is equal to Wave A. 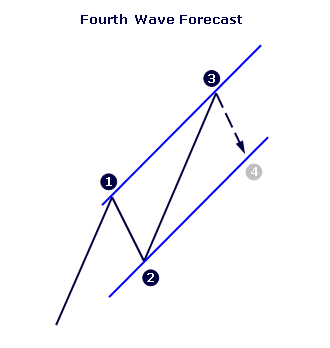 Use a channel to forecast the end of Wave 4. For example, once the end of Wave 3 is formed, draw a line connecting it with the top of Wave 1. Then, take the parallel of the line and place it at the end of Wave 2. Wave 4 will likely terminate at the bottom of the channel! 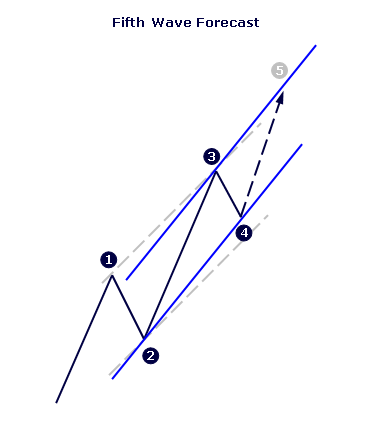 Now, continue the channel concept and forecast the reversal point for Wave 5. Next, draw a line connecting the termination points of Waves 2 and 4. Take the parallel of the line and project it from the end of Wave 3. Use this channel as a projection for Wave 5 price action. by Robert R. Prechter, Jr.
And... for the latest Elliott Wave news and commentary, click here.